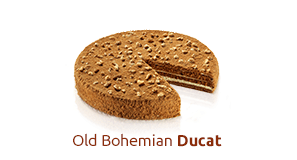 Old Bohemian Honey Cake is handmade from a traditional family recipe, with the ingredients carefully handpicked and used in an exact and precise ratio, which allows for a perfect fusion of the crispness of aureate honey wafery layers with two kinds of heavenly cream fillings. So uplifting is the combination that it inspires elated admiration in the most discerning of gourmets. 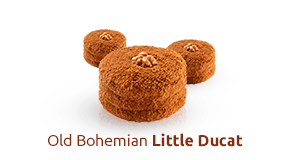 In the production of Old Bohemian Honey Cake, close attention is paid to the origin of ingredients – flour, eggs and walnuts have to be of the highest quality. 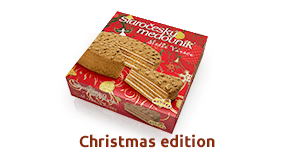 Honey, carefully selected as well, must contain no colouring agents, stabilizers or „E numbers“ (food additives) – which is also true of the cake as a whole. 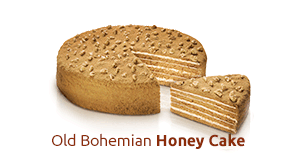 Old Bohemian Honey Cake's exceptionality has been repeatedly recognized by its winning the Pearl of the Zlín Region Award. 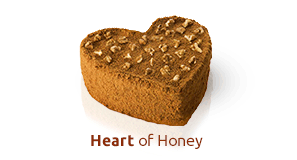 Honey cake can be stored at the temperature of 0°C to 6°C for up to 21 days. However, it retains its quality for three months if kept frozen at -18°C to -25°C. The cake should be sealed in plastic film to prevent it from drying and staling while stored. Before serving, take the cake out of the refrigerator and slice it. We recommend that you let the cake „warm up“ for about 20 minutes at room temperature. The honey and the fillings will become creamier and the cake will soften and unfurl its typical fragrance and taste. Honey cake is best served with unsweetened tea or coffee. At the moment, there are several size and weight variants on offer. Dough – melt butter in a pot on the stovetop, then add milk, egg, sugar, honey and baking soda. Once you melt everything together into a uniform mass, pour it into a bowl filled with flour and make a dough. From the dough, create five slabs (layers) of equal size and bake them one after another for 5-7 minutes in the oven preheated to 175°C. Before the layers cool, trim them into a desired shape and create a sort of breadcrumbs from the leftovers to use for crumb coating. Cream filling no. 1 – pour the condensed milk (Salko) into a bowl, add pieces of butter and whisk thoroughly. Cream filling no. 2 – dump the sour cream into a bowl and fill the plastic cup with icing sugar. Then pour it out into the same bowl and stir until smooth. Finally, when the layers have cooled, spread both cream fillings evenly on each layer – spread the milk-based filling first. Spread cream fillings over the top and sides of the cake, then crumb coat it with ground walnuts and trimmed off pieces of layers.